It is doubtful that any of the small choice of ‘lightweight’ backpacking tents available to those with limited funds in the 1970s and ’80s could pass muster against the more reasonably priced tents available today in terms of durability and weight. When Three Points of the Compass infrequently set forth in to the back country as a teenager, I would either pass the night beneath an army poncho spread between trees or cowboy camp (usually to be awakened by rain in the middle of the night). Progress into the army at the age of seventeen simply saw me using a better class of poncho. Once I was in possession of a half decent wage I looked around and selected the tent that stood me well for some seven or eight years. This was a nylon Robert Saunders Backpacker. It had two poles at the front giving a good clear doorway with no centre pole obstructing the way, something today’s designers could learn from. The inner was around a metre high at the front and sloped toward the rear where there was a single pole. The floor also tapered toward the rear.Not my image or tent, but a photo of the old Saunders Backpacker can be seen online here. It was a fairly similar tent that followed me into the army. This was the single skin Karrimor Marathon Mk II. Beside using it on my own adventures this also went on the occasional military exercise. Frequently two of us would squeeze into its limited interior, the envy of my army colleagues below dripping, windswept tarps. Karrimor Marathon Mk II. 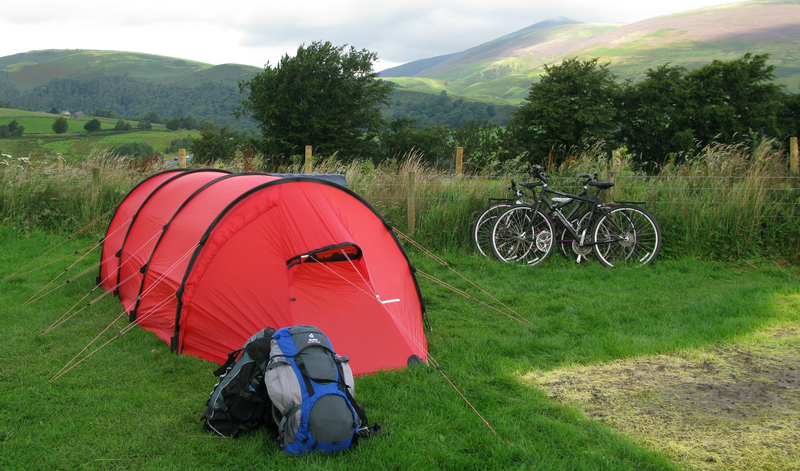 Not my image, not my tent, so not my fault as how it is pitched! One weekend I went out on a wander around Hampshire. I had no real destination and simply wanted to get away. I eventually walked in to the night in an attempt to find somewhere away from habitation suitable to wild camp. In the dark I found what appeared to be a low hedge, pitched in its lee, brewed a cup of tea and climbed into my sleeping bag, exhausted. I was woken by an approaching drumming on the ground. It ceased briefly as horse and rider cleared both jump and my tent before continuing down the course. I think the time in which I packed up and left Tweseldown cross country race course is still a record for me today. I lent the tent to a friend while I was posted overseas, on my return it had vanished, I mourned its loss. 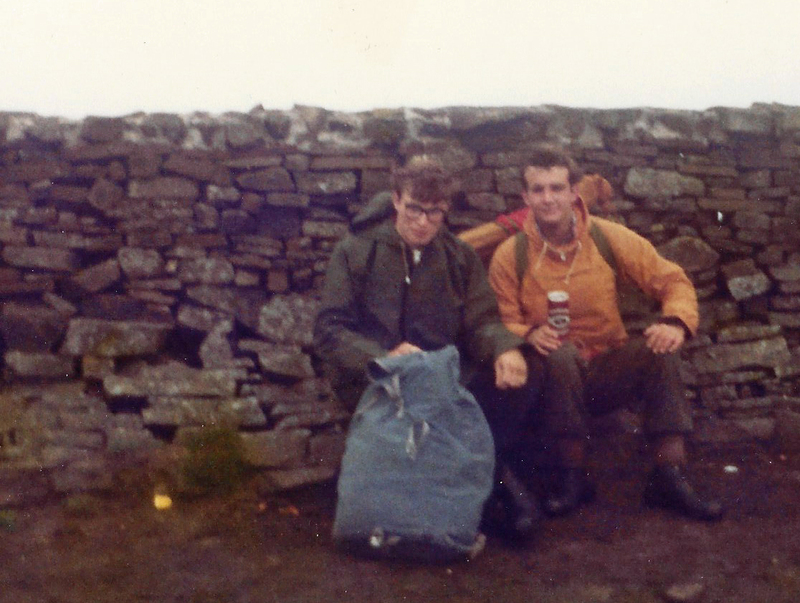 Whilst in the army, adventure training in the Lake District in 1979 was a memorable occasion. Taking over the entire end of a sloping field, my troop was issued a large canvas ‘shed’ with no windows and a tie down flap door, the whole of which was stretched unwillingly over a near indestructible framework. Our days were spent running up and down the local fells, interspersed with sailing on the local lake. They were interrupted by one of the worst storms the area had encountered. At midday on day five our lieutenant called a halt to our activities and we returned to our camp site. He retreated to his personal and expensive tent, a Vango Force Ten if my memory is correct,. We retreated to our dark cavern to wait for night in an increasingly sodden field, clutching cans of Tennants, our shouted conversation drowned out by the constant flapping of the soaked canvas and screaming gale. I drifted off to sleep at some point to be wakened by half daylight and what I thought was someone pouring a bucket of water over me. The water turned out to be rain, our tent had been bodily lifted from the ground and went sailing off into the unknown, never to be seen again. We piled into the four- tonner and drove into the nearest town to be put up in the local boozer. The extended lock-in didn’t last more than a few hours though. The river rose and burst its banks and we spent the next three days filling sandbags in a largely successful attempt to save every household we could. Such are the dubious joys of organised camping, when organised by someone else. We still get extreme weather but the tents available to us now enable us to withstand adverse conditions that would have sent us scurrying back home only a couple of decades ago, unless your name was Scott or something similar. Modern tents are a light year ahead in materials and design terms from what we had back then. Despite advances in design, and there are some very clever tent designers out there, my belief is that what is simplest is probably best, as there is less to go wrong. Where the true progress has been is in materials. Gone are the canvas ‘pup’ tents, instead we have materials that are stronger, lighter, stretch less and hold far less water. Though the problems in pitch, condensation, and damage from UV remain, they probably always will. As to choice, well, it is down to the individual. One need only cast a glance at the myriad of tents parked on a field close to any large Cotswold outdoor store during the summer months to realise that the occasional camper need not spend a vast amount of hard earned dosh to obtain a perfectly reasonable abode. What you will invariably get though, is a compromise. Cheaper tents will be manufactured of cheaper materials; a bit heavier, a bit bulkier and more prone to wear and damage as a result. For most occasional weekend campers, camping during the summer months, these concerns need not matter. It is when you move into the shoulder months or even winter that the make and design of tent start to really matter and any shortcomings become amplified. When you have constant torrential rain accompanied by high winds. When you have spindrift, blown sand, midges. 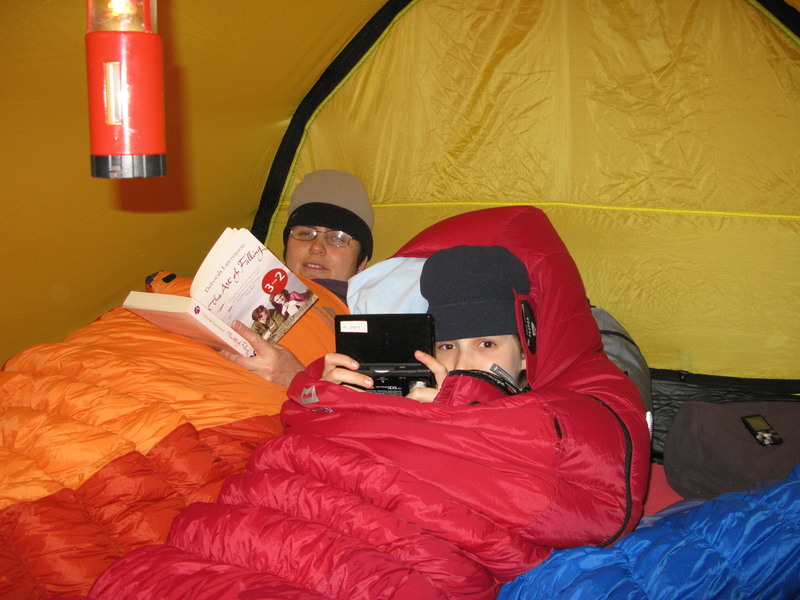 When you camp above tree line or engage in surreptitious wild or ‘stealth’ camping. When you actually have to carry the damn thing, rather than loading it into the boot of a car, that is when quality becomes apparent. For our reintroduction to camping as a family, our Colman Columbus 8 man tent was just about large enough for the three of us, home from home- almost. Dorset, 2007. Note- this is not a lightweight backpacking tent. Today, my own preference is to do a little homework and not be afraid of buying quality, even if the price is severely inflated as a result. Car camping over the past decade has seen me quickly progress from our family tent purchased in April 2006. It was enormous (both when erected and packed) but provided the buffer zone of comfort required by a dubious wife and child. Despite the PU coated polyester having a hydrostatic head of 3000mm, airflow was so poor inside the tent that it often appeared to be leaking. Our Coleman Columbus 8, weighing some 25kg, was changed to a much more respectable Hilleberg Keron 3 GT within a couple of years. This was only possible once I had convinced ‘she who must be obeyed’ that this camping malarkey was a ‘good idea’. Hilleberg make some damn fine tents- real genuine quality, they are made to travel to the poles of the earth, or even the Lake District. The Keron (bought second hand) was followed by a Hilleberg Nallo 3 GT (again, second hand), possibly an even finer piece of work. Hilleberg Nallo 3 GT, side view. Both of the Hillebergs are of a tunnel design with a door at each end. This provides a lot of interior space and was perfect for me, my wife and daughter to stretch out in. The inner tent is bright yellow which gives a cheery interior light, particularly on dull days, something that green and blue coloured tents fail miserably at, things appearing very dull and gloomy in these. 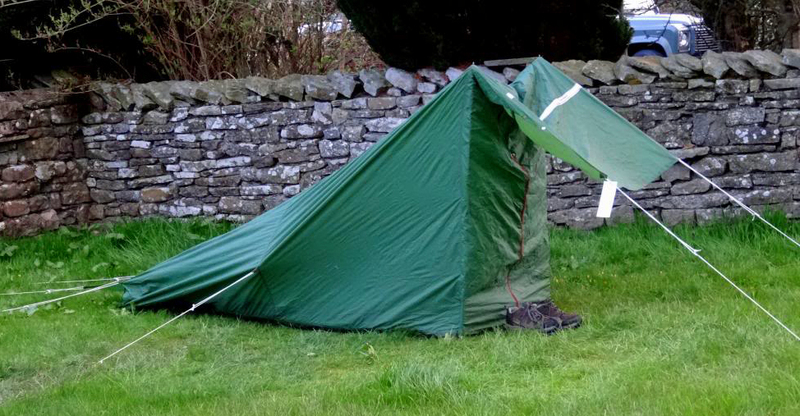 The GT on each of my Hilleberg tents refers to the extended vestibule. This provides extra room for stowing muddy or wet gear and, with extreme care, the potential for cooking inside. Something that is not recommended or supported by any manufacturer but we have all done it, haven’t we! The fly of the Keron was made from Kerlon 1800 which has a hydrostatic head of around 3000mm. The Nallo fly was made of Kerlon 1200 with a hydrostatic head of around 2000mm. Both materials are fantastically tough. Neither though, are light enough to really consider taking backpacking. The Keron weighs 4900g, the Nallo weighs 3100g. But of course backpacking wasn’t what they were purchased for. 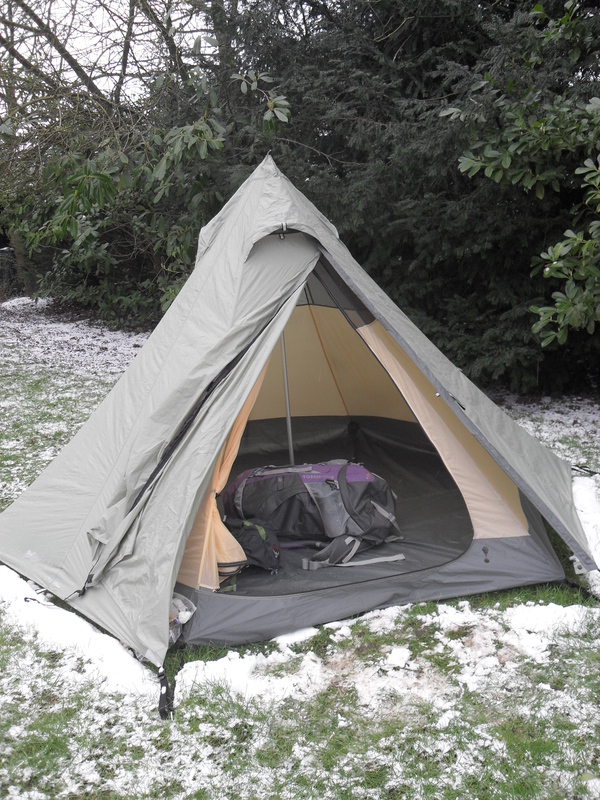 For backpacking, which required a smaller, lighter tent, I did a bit of research and eventually Three Points of the Compass went old-school, to one of the oldest designs of tent there is, the single centre pole, pyramid shaped Eureka Wiki-Up SUL 3. 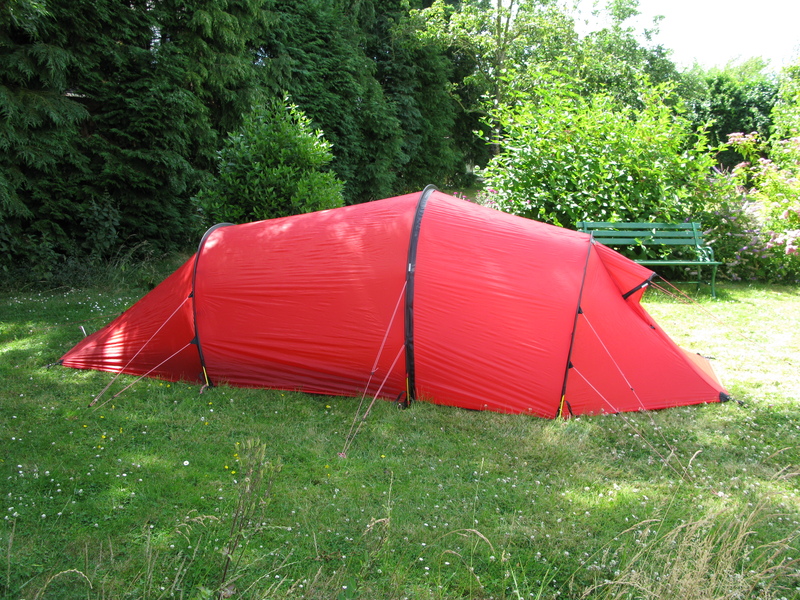 The Eureka Wiki-Up SUL 3 is based on the Golite Shangri La-3 (itself modelled on their Hex tent). The fly is 20D siliconized ripstop nylon with a hydrostatic head of >2000mm. There are three hooded vents at the peak. I had heard of complaints of horizontal rain being driven in these but I have never experienced that. The fly weighs 782g. The pegs (126g) that came with the tent were rubbish so I swapped them out for my own pegs. These are six aluminium Y clamcleats at 15g each and six 3mm titanium shepherds hooks at 5g each, total 110g. Just one single centre pole is used with this pyramid design of tent. This is a lovely piece of kit that weighs 324g, but right from the outset I planned on using this very infrequently. Instead, the pole can be left at home and my two walking poles can be joined together with a central alloy walking pole extender bought from Backpacking Light, this weighs 46g. The inner is 20D breathable nylon, this comprises of ‘solid’ walls with mesh for the top third. It has a built in bathtub floor made of 70D PU coated nylon. This has a hydrostatic head of >4000mm. The weight of the inner is 948g which takes it out of the extreme lightweight bracket for one but is perfectly acceptable when used for two occupants. Pack size is about 150mm x 450mm. The interior is positively cavernous, something I really appreciate over the minute proportions of some lightweight backpacking tents I have clambered in and, with great difficulty, turned round and clambered back out. 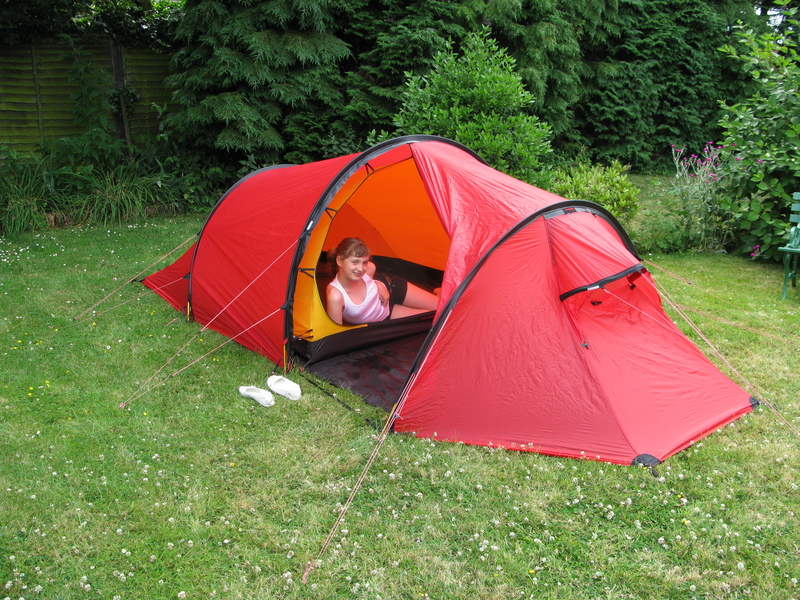 My intention when I purchased the tent was to buy a bespoke inner made by cottage industry Oookworks. This would have weighed between 300g and 490g depending on the size of inner I purchased. However my emailed conversation with them sadly became a one-way affair and I was unable to place my order. 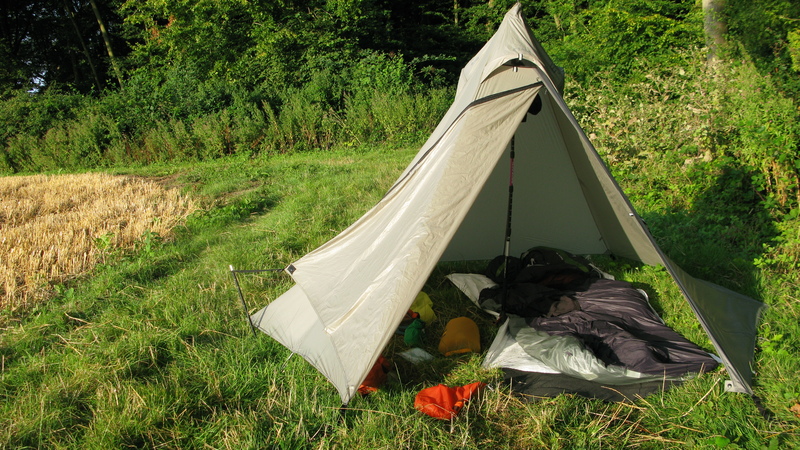 Instead, when solo camping with this tent the inner stays at home and I use a piece of tyvek for a partial groundsheet (143g) and a huge Katabatic Bristlecone bivvy bag (305g). Three Points of the Compass needs to lighten this set up still further, particularly for my Long Walk. I am not going to find what I need from any of the mainstream manufacturers so will have to look to cottage industry again as this is where the needs of lightweight hikers are truly being met. Mostly because the people making the gear are the people using it. This is one of those terms that sounds far more technical than it actually is. A material is deemed to be waterproof if it can withstand a column of water 1000mm high without leaking. This would have a hydrostatic head of 1000mm. If a material is put under pressure or stress it will require a higher hydrostatic head to continue being waterproof. This is why tent floors need, and usually have, a higher hydrostatic head. 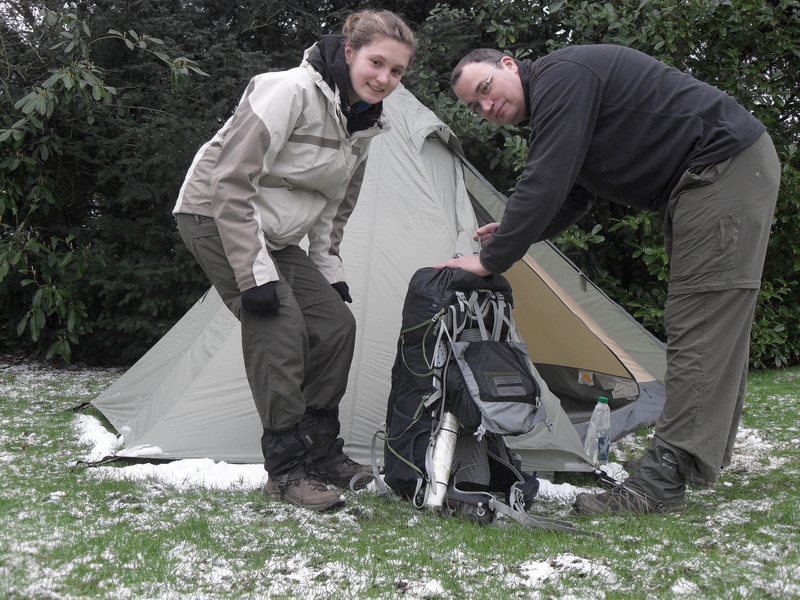 What can appear as leaks in a tent are frequently something else. It could be that seams are leaking, usually through the stitches. What is far more likely though, is that it is condensation on the inside of the tent. It can be a battle to ‘batten the hatches’ against the elements whilst still retaining sufficient airflow to prevent or at least minimise the problem of condensation. 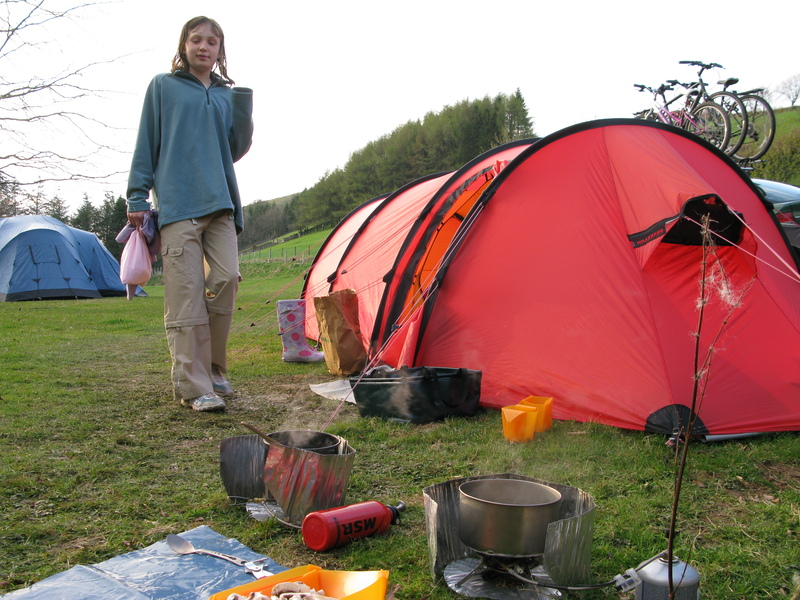 Cooking inside a tent only increases the problem with steam condensing on the interior. Some of those early tents were great pieces of kit. I also seem to recall another one where the bicycle acted as the poles, dedicated for cycle tourists. I suppose the closest you get these days is the various tarp sets ups. Not that I do cycle touring these days. Must admit though, I have been very happy with using my two Pacer Poles as the uprights. How is your Marathon tent material holding up with the UV exposure? I am considering buying a duplex tent which is both very light but also quite pricey. From the « September 18 » chapter, I understand that you practiced this tent during 5 months that is around 150 nights or less. I am annoyed how worned out it seems after. You also mention that it is not a mountain tent. Could it be that the design combining single wall + open door (to ease air flow and prevent condensation) add special stress to the holding points of the tent under windy conditions, that tent being better suited for quiet air conditions ? Or may be according to your tent experience (mine is very limited to a single model used less than 30 nights) 100 nights is a quite decent score ? Thank you very much for your answer. I ll probably go for it because of its weight although I do not use treck poles but I am still building my opinion comparing to the Hogan from Vaude and the Nemo from MSR which are both heavier and not so roomy. As you said every tent has its downsides. I understand that the end panels you refer to are the door panels ? I saw on the net people using the loop for the toggle of each door to set another guyline. This should give more strength. But it seems that the door panels do not reach the ground anyway which means that air goes underneath even when not desired giving stress to the structure instead of simply running over the tent ? Thank you very much for your answer and sorry for my misunderstanding. Having not experienced the duplex, I had thought that the natural winward side was the door side with its soft slope. May be such a configuration is too unconfortable (too much air) in windy conditions. If I understand it well, your advice would be to reinforce the holding points of the end walls (those without doors) adding for instance extra loops (sold by zpacks) to allow extra guylines on these walls and lessen the stress on the others points ?